Graduation Day 2009 – Something's Burning……. This past Saturday, our families celebrated Emily’s (my daughter) second graduation from the University of Arkansas at Fayetteville. Emily showing her Master's Hood Colors. 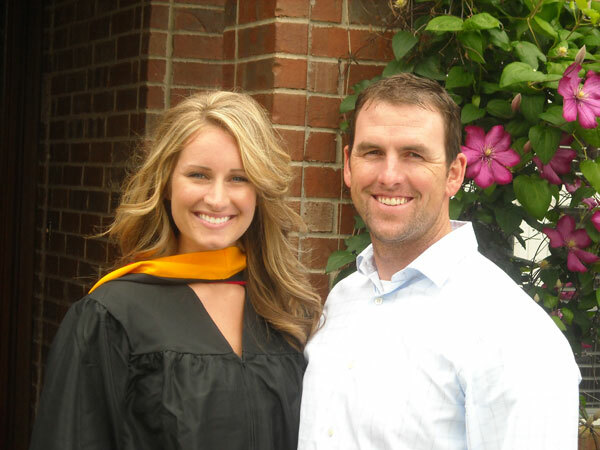 Emily received her undergrad Bachelor’s Degree in 2007 and on Saturday, May 9, 2009, she received her Master’s in Speech Pathology. 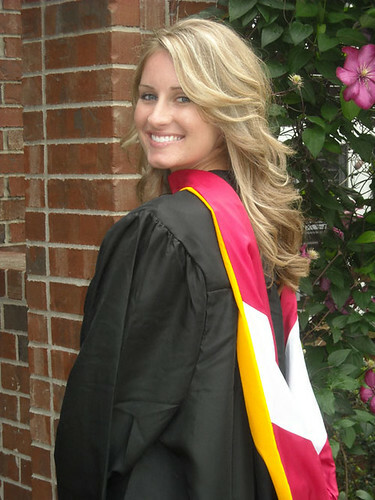 She graduated with a 3.8 GPA and begins her career on May 18th with the hospitals of Cox Health in Missouri. We are very excited for her and her husband, Kyle. I threw a post ceremony graduation luncheon for family and friends. I prepared my family recipe for Smoked Brisket, Pioneer Woman’s Asian Noodle Salad, Cheese Bread based on PW’s Olive Cheese Bread, Cake Balls that Bakerella showed us how to make back at PW’s Ranch last month. I also dipped some fresh strawberries and served the cake balls and strawberries with a side of strawberry or vanilla ice cream. They raved about everything and ate it all! Son-in-law, Kyle, helping himself to some of the PW Asian Noodle Salad. We took lots of photographs and had a wonderful day. So here’s to Emily – Congrats, baby! Their next adventure: they are building their first home this summer. I’ll post photos of the entire process. The plan is great! Previous Post Good Mornin’ ! 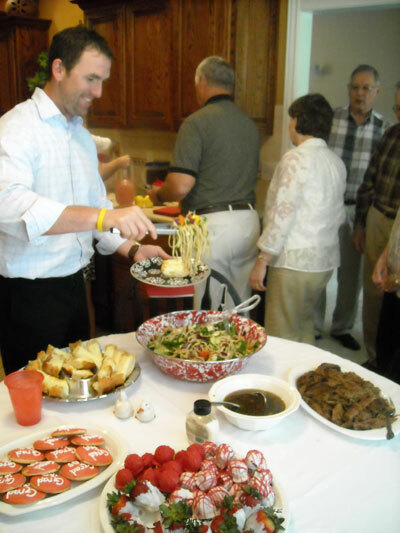 Looks like a good time……..and a yummy spread!! Hope you were able to enjoy the day too!! First of all, your daughter is gorgeous! I’m afraid any young men she tries to help will develop a stuttering problem just from being near her, lol. But she also looks very sweet and kind. Congrats to her on completing her masters and finding employment! Your menu sounds delicious. I’ll bet no one wanted to leave your house! Emily is beee-u-ti-ful! Congrats to her! And I want that food. Thanks. Everything looks great! I’m so glad the day went so well after all your hard work. Em looks beautiful and she & Kyle make such a handsome pair! Now, settle down for a margarita or two. You’ve earned it! Very cute daughter, and a menu to die for!! Must of been a GREAT day!!! How beautiful!!! And what a fancy spread you put out! I’m glad everything went well, despite the weather and the fretting. But with THAT menu, how could you go wrong? Yuuummmmm! And big congrats to your daughter! How proud you must be.